"Born in America; what a blessing for any child to be born in this great nation. What could be better? Still, for the child of an immigrant, many challenges exist. It has to weave its parents’ view of the world and their ethnic customs into the fabric of the new nation’s ideology. It must confront and make peace with other groups of youngsters from different ethnicities who are seeking the same relief. All this requires guidance. 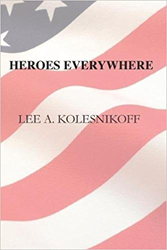 HEROES EVERYWHERE is about finding such guidance, even when it is not being sought."